Lou is right and may I just add that watching your wingman get pummeled and you can't do anything about it is frustrating. Good going MFair. Lucky to be alive. There would be no flights today. Becquerel was given 48 hrs leave to take his nose to Toul and have it looked at by an otolaryngologist. Ever since the knock received from the Lewis he was making whistling noises which was driving Gaston bonkers. With Ernest away there simply were not enough observers to man even one flight. As announced by le Capitaine yesterday, two new men showed up at the aerodrome this morning to replace Durand and Levy. After Adjutant Dumas gave them the usual tour of the aerodrome it was up to Voscadeaux to show them the ropes. Adjutant Tristian Marcaggi was an agreeable fellow. He was fresh out of flying school and absorbed all information that Gaston could throw at him like a sponge. He was mostly interested in spending his time in the hangars observing the mechanics working on the Caudrons. Sous Lieutenant Archand Dessarce was a different matter altogether. Throwing his rank around, he would not heed any advice Gaston would try to give him. Voscadeaux could see Dessarce was mishandling the engines but would not listen to any guidance. In fact, after Gaston’s remarks Sous Lieutenant Dessarce would abandon any further instructions and order Gaston to let him be. His rank provided all the knowledge he would need. After this announcement Gaston took his leave and decided to concentrate instead on finishing his bottle of wine waiting for him at the mess. All flights were still on hold until more observers could be mustered. Gaston’s Eindecker claim was rejected today due to lack of witnesses. It was a good thing Becquerel was away. Went up with 2 a/c to bomb the front lines and met the Hun Monoplanes with forward firing gun. Blimey , we never had a chance. The e/a dropped out of the sun so we never saw them til they opened up on us. I did the best I could Bobing and weaving about the sky. My gunner got off 2 drums full of 303 's and damaged one e/a . He turned away with smoke, Not Confirmed , But we had holes in the elevator and wings and gas leaking out. Ended up being forced down with Infantry amid Shell fire. I found my gunner to be badly wnd. and He stated that he saw our other ship go down with 2 e/a on his tail. Score: 2 Be's lost for 1 unconfirmed damaged. The Adjutant’s office offered only tedious work. As the clerk, I would take inventory on equipment lists, slogging round the hangars and trying to locate any spare engines, damaged machine parts, ammunition crates, etc. One particular point of annoyance was a drum of Lewis ammunition that had gone missing. I thought it would be of no import, but Adjutant Lovell sent me to locate it, all the same. After several hours of scouring the hangars, with no results, I finally retired to the mess for a break - and found it on the writing desk, where some joker had been using it as a paperweight! By any means, I was finally back on the active flight roster. Edith, however, was not, and as a result I have been assigned to a new observer, Capt. Barry Ackart. We are also flying A6333, as 6338 is waiting to have the new engine fitted. It felt unusual, climbing into an unfamiliar machine alongside an unfamiliar observer, but, as Switch-off had suggested, I had with me my lucky charm, the small ‘bindle’ of loose tea, which I tied to the control column. It made me feel a little better. We were given the morning O.P today, near Lille. At 10 past 9, up went the Verey light, and five Beardmore engines roared into life. Graves was in charge of ‘B’ Flight for this show, followed by Reid, McNaughton and myself. The sky was cloudy, but near St. Omer we found a great big disc that seemed to have been cut from the cloud. We skirted the edges of this disc as we climbed up above 5,000 feet, before heading out all the way down the lines, past Arras and down to Bapaume, further than I’d ever gone on a patrol. After a bitterly long and cold trip, we arrived at Beauhamel, and proceeded to patrol between this city, on our side, and Bapaume, on the Bosche side. Above Beauhamel hung a tremendous wall of cloud, stretching for miles upwards like a cliff-face. It was an eerie sight as we flew towards it, for it felt as if the sky were swallowing our little Fees whole! Into the cloud we went, as it collapsed around us, and I held the stick tightly until we were through the other side. When I got there, Reid & McNaughton had vanished. I re-formated with Graves and we went back to our patrol. 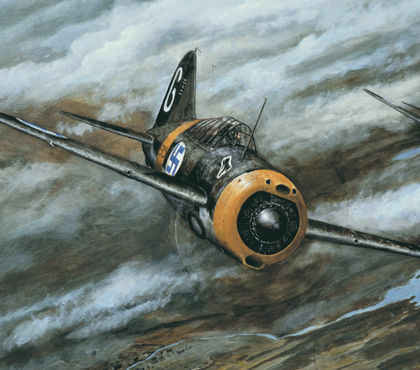 Eventually, after a thoroughly dull period of flying back-and-forth through otherwise empty skies, Graves became fed-up and fired the washout signal. We made our individual ways back towards Clairmarais and, wherever they had gotten to, I assume that Reid & McNaughton also saw the signal, for they arrived about ten minutes after Graves & I. ‘C’ Flight are up for the afternoon patrol. Perhaps they shall see some more action. Last edited by Wulfe; 02/02/19 01:57 AM. Of course, I am talking about this mod - WOFFUEMk-1WBomsightsAll_in_Onemod-v1.4 . I was using V1.0 so was out of date. The newer V1.4 works (did a quick test in a Quick Combat 'Free Flight'). Thanks!!!! UPDATE: It works in quick-combat but does not work in campaign. Weird. That is definitely problem in RAF_BE2C_sqd.xdp file. I will update the mod with corrected file today or tomorrow. Flight operations were resumed today once Adj. Becquerel returned from his leave. Gaston was paired with Sous Lieutenant Dessarce to attack the Verdun rail yard spur line NE junction. Gaston winced with every engine sputter coming from Dessarce’s plane. If he keeps abusing them like that, he will have no engines left for the return flight. They crossed the lines among the usual puffs of Flak welcoming them to the Front. There were no other planes visible anywhere around, which could not be blamed on the weather. The conditions were perfect allowing for excellent visibility. The rail yard would soon be in range when Voscadeaux noticed dark wisps of smoke emanating from Dessarce’s airplane. The wisps grew larger transforming into trails marking the flight’s location for miles. Sous Lieutenant begun to lose altitude and turned west toward the closest front lines. Gaston pressed on watching the smoke trail disappear in the distance. The rail yard came into view and he noticed a train leaving the station. The Caudron was just flying over it and this gave Gaston an idea. He wondered if he could hit it. He aimed and let one of the bombs go, then watched as the train passed under and the bomb exploded harmlessly behind it. Well that was fun Gaston, but next time account for the train’s movement. He aimed again and released his last bomb over the sheds. He watched it explode just short, inflicting minimal damage. There were no excuses for that one. The sheds weren’t moving even one inch. Gaston sighed. He was sure le Capitaine will order them to repeat the mission tomorrow. He swung his crate around and headed for home. Voscadeaux felt indifferent when he learned that Dessarce made it safely back to the ground on the French side. Gaston would prefer the Sous Lieutenant to get a taste of German hospitality for a while and learn some humility. Fullofit, sounds like S'Lt. Dessarce is a real prig. It would be nice if something, or someone, would take him down a peg or two. Sorry Gaston's claim was not awarded, those brass hats can be real prigs too. Wulfe, glad to see that Graham is back on the active roster. Paperwork is such a boar. Carrick, Nigel and his crew appear to be in the thick of it at the moment. Let's hope things get better for them, else wise there may be none of them left to carry on the fight. 2nd Lt. Swanson had a full day. 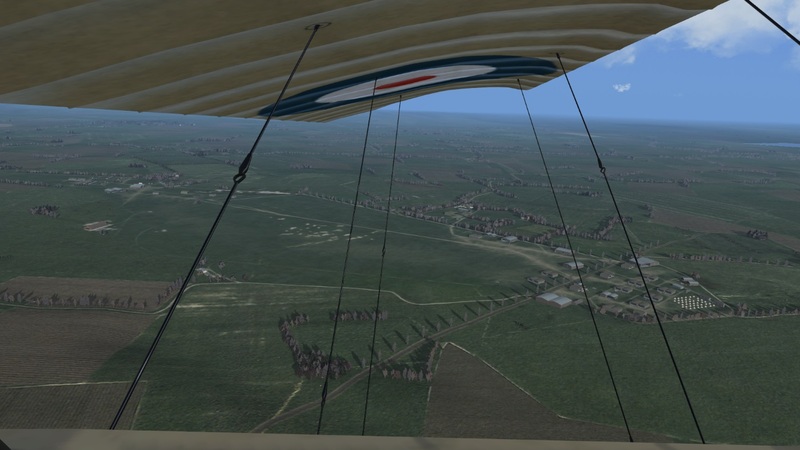 This morning first thing the Major sent him to St-Omer to fly back his replacement mount - a nice, fresh Morane. Once in the air with it Swany found it to handle beautifully and was quite pleased. He was also stunned once again at just how large the facilities at St-Omer really are. Upon his return to Auchel he was informed that his new bus would be immediately checked over and made ready for the afternoon mission, a bombing sortie on the Hun aerodrome at Epinoy. Swany looked at the map and was more than a bit nervous when he saw the intended target was at good 15 miles into Hunland. He hoped the new Parasol ran as sweetly there and back as it had from the depot. He needn't have worried, the entire trip went without incident and he and Chris actually got a hit on one of the hangars at Epinoy. On the return home Archie got rather close and bounced them around, but apart from that it was a fine outing. And not a single EA was seen. Marveling at the size of the facilities at St-Omer. A direct hit at Epinoy! Archie getting just a bit too chummy. Lou, I am hoping Becquerel would be able to take him down a peg, or two. We shall see. Good to see Swany back in the air and in a brand spanking new machine to boot. Hope he treats her better than his last ride. Just as Gaston suspected, the C.O. let his displeasure be known regarding their poor performance from yesterday and ordered the two men to complete the mission as originally planned. No slip ups, no more bad engines, no misses. Voscadeaux was following Dessarce over the rail yard he “visited” yesterday. He paid close attention and took great care to aim his bombs. He didn’t want to come back here third day in a row. His aim was true. First bomb went through the roof of the large shed destroying it and the adjacent structure as well. The second bomb exploded in the middle of the yard, setting on fire many crates with supplies and ammunition. He was pleased with himself and returned to the aerodrome in good spirits. S.Ltn. 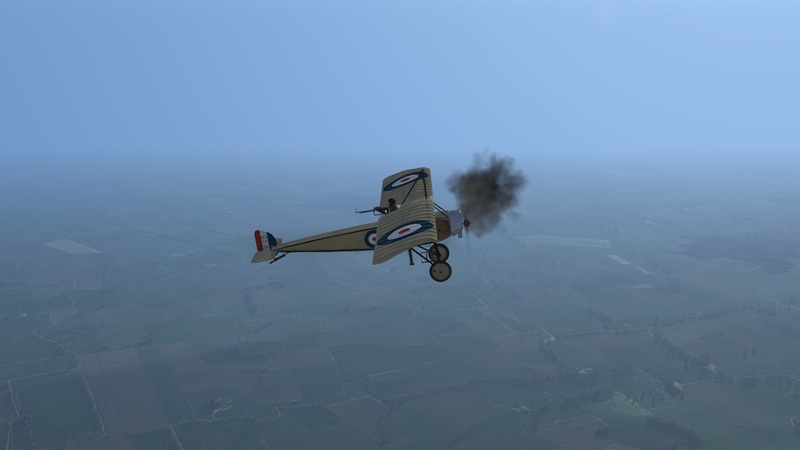 Dessarce managed to keep his Caudron in one piece ... mostly. As he was making his circuits around the base, the engines begun to smoke again. He was able to land among great billows of black smoke and stench of burnt oil. Gaston simply rolled his eyes and headed for the mess. Adjutant Dumas announced that a new pilot arrived on the base while they were completing their mission. A certain Sergent Gaspar Tourand. Gaston decided to introduce himself tomorrow in the briefing room. He was parched and in need of wine. I'm really enjoying all these stories and adventures, but I like the videos the most. Unfortunately I don't know how to make them. Any hints? I am hoping this letter will find you in good health. I am writing to you only a few words as I don’t have much time. I have great news! Today, after my mission I was called into our Capitaine’s office. You will remember him from my previous letters. Capitaine de Bondy announced that I am being transferred to a new unit. With the ever-growing threat from the Boche aeroplanes the French Command decided to bolster their scout ranks to protect the vulnerable observation machines. This means moving promising pilots to new units. I’ve been chosen to fly scouts! The little contraptions I’ve been telling you about. I have to pack today and take the train this evening to my new aerodrome west of Verdun. I’ve been told I will be joining Escadrille N37, which means I’ll be flying Nieuports! I will write more once I’m there. I hope you are very proud of me and I miss you and the girls very much! Please give Giselle and Bernadette my love. When I broke the news to Ernest he was very upset, but after discussing it over a bottle of la gnôle I convinced him to let me go and for him to enlist in pilot school. Perhaps we will meet again? I had to give Becquerel your picture I kept stuck to the cockpit. He is convinced it is a good luck charm. In return, Ernest gave me his picture when he was still in the army, which I am enclosing in this letter. You’ll finally see what the man looks like. Then select IN-GAME OVERLAY as shown above and click on another button called settings. An overlay should pop up with more settings. 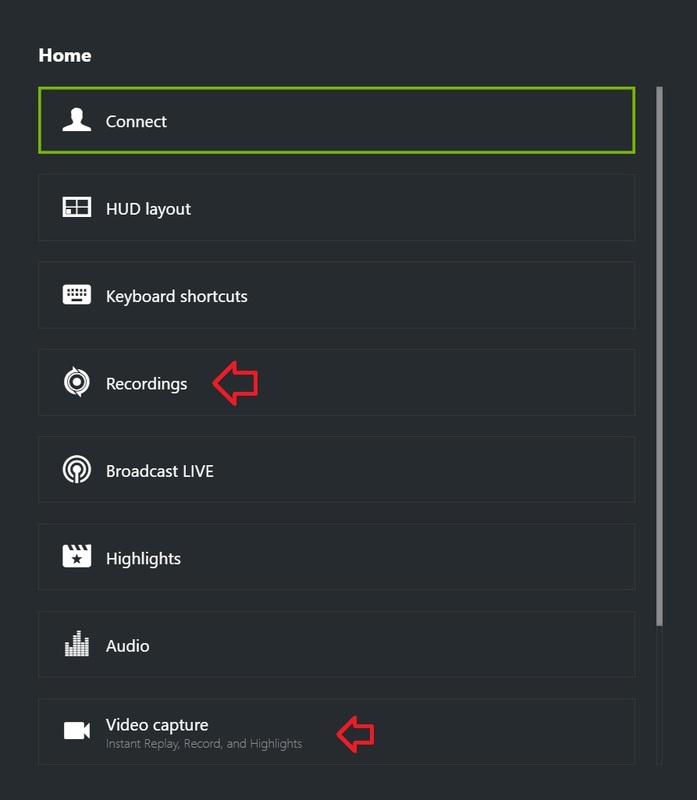 The ones you are interested in are: Video capture, where you can adjust recording's resolution, bitrate and other goodies. The other page is Recordings, where you will tell the program where you want your movies to be stored. Pick "Trim" and with the scale at the bottom of the picture adjust the video to only the part you want to see. Hint: the white dots indicate the beginning and the end of the trimmed movie. Drag those white dots with your mouse to the desired moment - the movie will adjust while you're dragging so you can see what's happening. Once you're satisfied with your short version of the movie click on "Save as" and specify where you want it saved on your computer. You will have to create a YouTube account to post videos there. Or Google video account, or Vimeo. Whatever works best for you. If you already have an account, upload your trimmed video there. You will get a link that looks like something like this: "https://youtu.be/7o_wfuSL". Copy this link to clipboard and you are almost done. Now to place it in this post. Then pick the correct format. Pick YouTube Video if you posted your movie to YouTube. A window will come up where you will paste the video link you copied to clipboard earlier. Click on OK. Finish your post and you should be done. Good luck and … do join us in the DID Campaign! Congratulations, Gaston, on moving up to Scouts! May you go on to be France's Ace-of-Aces! After our return yesterday, I headed into the Vincent alongside Jacky-Boy. My compatriot certainly had a spring in his step, practically bounding through the door, and I soon discovered why as Jeanne came bounding into his open arms. After their embrace, we were shown to our table, and sat down for a delicious lunch, consisting of an omelette, freshly fried mushrooms and, of course, a cup of green tea for myself. As Jeanne glided from table to table, pouring coffee and making eyes at the smitten Jacky-Boy, I nudged his arm and gestured with my eyebrows at the waitress. “Well? How did you manage it, you dog?” I asked, with a smirk. With a grin that made it look as if his entire face would split in two, he leaned in close. “I’ll never tell”. He said, and I almost fell out of my seat. “What! You must!” I responded, as the sly fox fell back in his chair, laughing his head off. Three tables away, Jeanne was laughing too. Lucky Jacky-Boy. I had, too, developed something of a fondness for Jeanne, only I had not acted upon it. By any means, if I was to retain any sort of morality, the opportunity was lost. Jacky-Boy and I finished our lunch, idly chatting among ourselves about our various trips out over the front, as I pushed my disappointment to the back of my mind. We returned to our Billet, only to find Switch-off dragging a packed suitcase down the front steps. “The C.O says we have to move closer to the aerodrome!” he explained to us, and Jacky-Boy let out a groan, called the Major a ‘Bloody Bore’, and skulked off inside to begin packing up his things. Our new Billet was a cozy little stone cottage that sat down a road a short walk from the aerodrome, which the four of us were to be bundled into. Pleasantly, it was next-door to a three-storey building which housed some more of our fellows, including Archer and Pearson. Jimmy Reynard was off on the ‘C’ flight show, so we decided that we’d pack his things and bring them along, on his behalf. It didn’t take us long to settle in and make the place our own. Switch-off’s lucky scarf found a home on the hat-rack by the door, and his gramophone was placed in the corner, on top of an old empty crate. The furniture was hastily rearranged with our future card-games in mind, and Jimmy Reynard decorated the wall above his bunk with several raunchy pictures of young ladies that he’d procured in various magazines in St. Omer. Magazines, I may add, that only Reynard seemed to be able to locate. After a night of wagering over card-games, in which young Switch-off was made poorer but wiser by us all, we retired for the evening. The morning rolled in, and once more I marvelled at the frost-touched land as we made our way, sharing cigarettes between us, to the briefing-room. Being far closer to the aerodrome than we were used to, we were even early, to the visible surprise of half of our pilots. Even the immovable Major’s eyebrows raised slightly. ‘B’ flight had the morning show - we were being sent back to Bapaume, this time on a Reconnaissance. Happily, Reynard would be accompanying us as one of the two covering Fees - the other being flown by McNaughton. As we walked towards our machines, Graves & Reid idly discussed the route towards the target - what landmarks to use, et cetera. Reynard, with Bristow (his Observer), sidled up alongside me. “Ho, Cambell, A’ve nivver been that far doon the lines, what’s it like doon there?” he asked, cautiously. I patted him on the back, grinning. “Not a Hun in the sky, Jimmy! And the archie gunners are half-asleep. Save for the length of the trip, it’s a perfectly pleasant show!”. This seemed to reassure Reynard, who breathed a happy sigh of relief as he pulled his flying cap over his red mess of hair. At my machine I again found Capt. Ackart waiting for me. “Morning, Campbell”. He said, with a slight air of contempt in his voice. It was no secret that the Captain-Observers didn’t care one bit for the idea of flying with a Sergeant-Pilot at the controls. I merely nodded, as I climbed into the Cockpit of A6333, tying my tea-bundle charm around the flight stick. Down the flight-line, I caught Reynard’s eye, and he cheerfully waved to me. The Ack-Emmas presently had our engines purring over, and the Verey light went up. Down the airfield we went, our Beardmores roaring out Forty, Fifty, Sixty miles an hour, and soon we were all up, five machines, soaring into the blue. We made the usual climb around St. Omer, into a beautifully blue sky with lazy high cumulus rolling forth. One cloud in particular caught my eye, for to me it looked just like one of the four lion statues that stood at the feet of Nelson’s Column in London. I cannot explain why I saw this, but there it was! We passed SOuth under the Lion’s feet, and headed out past the Foret de Nieppe, and towards our target at Bapaume. 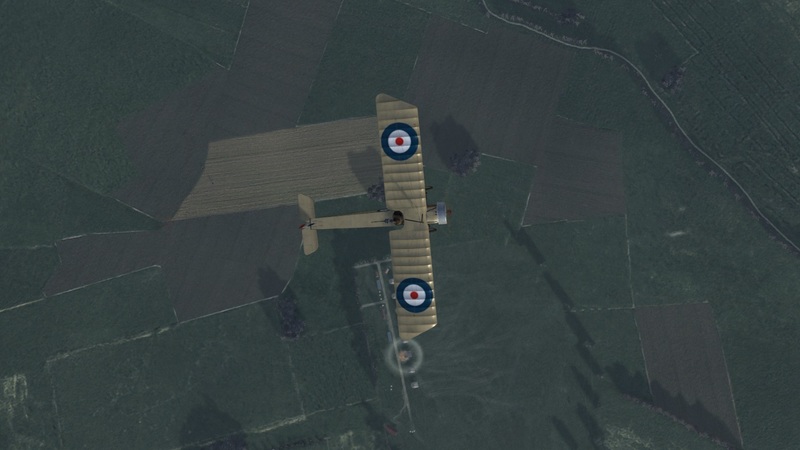 After a long and eventless flight, with Reynard & McNaughton flying quite a ways ahead of us, the lines came into view as we crossed over the top of Arras, passing by a pair of B.E’s, who’s crews cheerily waved to us. As our shadows crept into the mud, Ackart and I sharpened up. Above us, a lone French Nieuport wheeled across the sky. Below, our boys in the trenches were having a hard time - every now and then, the ground would rear up as German shells came down around the front-lines. I grimaced in sympathy as I watched one such shell land in the centre of a British trench. Leaving the Tommies to their own war, we crossed into Hunland and Reid’s bus manoeuvred into position to photograph his target. We begun to hear the now-familiar ‘woof-woof’ of Archie around us, as we indifferently glided over the German lines at 5,500 feet, but the fire was just as lazy and inaccurate as yesterday, and we made our rounds without much trouble, and turned for home. On the return trip, 6333’s engine suddenly begun to splutter, and quickly died. I switched to the Gravity tank, and the engine thankfully coughed into life. Checking my map, and my position, I decided to put in at Izel Les Hameux aerodrome. The Ack-Emmas looked over our machine, and found that a seal on the fuel line had deteriorated and broke away, assuring Ackart that we would be on our way by the early evening. After telephoning Clairmarais, I was invited by a cheery-faced pilot, Lieutenant Lawrence, to join him in No. 13 Squadron’s mess. As it turns out, theirs were the two B.E’s we’d seen coming across the lines. They, too, had been photographing German troop positions around Bapaume, and we discussed the possibility of an upcoming push in the area. We stayed to have our dinner with the chaps of No. 13, who later came out to enviously scrutinise 6333, some of them even asking to climb aboard and get a feel for the cockpit. Ackart allowed this, and after a warm goodbye we headed home, for an evening of songs in our own mess, with Pearson tinkling pleasantly away on the piano. Last edited by Wulfe; 02/04/19 01:52 AM. Awesome! Thanks for the info. My card is from "The Other Company", but I'm sure from here I'll be able to figure it out. Thanks again. Wulfe, thanks for the vote of confidence! I am not so optimistic myself. 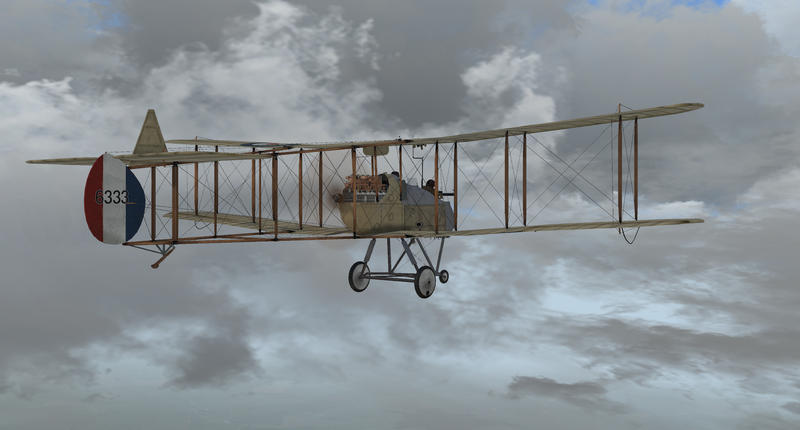 A stable two-engined Caudron is a totally different beast to a squirrelly, lose-your-wings-at-any-moment scout. Time will tell. So, Jeanne’s been spoken for. That didn’t take too long. Also, it looks like there is much more traffic going on in your part of the woods. Gaston barely sees a soul on his patrols. It’s possible he may need glasses. What? Not even during halftime? You are welcome. Let us know how it goes. Ah, well, I wanted to get a little more out of that 'storyline', but being pressed for time (yes, even during half-time!! ) I felt it best to expedite things a little, before I forgot about it entirely! Jacky-Boy isn't complaining. Last edited by JJJ65; 02/04/19 04:07 PM. Congrats, Fullofit, on your quick transfer. In case you are all wondering, about two weeks ago Fullofit had a random visit from the Campaign gods informing him that he could apply for a transfer to Escadrille N37. In keeping with the premise of the Deep Immersion Campaign, this is something we can each hope for in time. In his case, the build-up of French scout squadrons in the Verdun sector (and Gaston's knack for annoying his various bosses) suggested the move. In time, we'll all get the call. Also, awards will be issued by the Campaign gods, following historic norms. While German pilots can announce their Ehrenbechers when they get them in-game, all other awards will come from the Campaign Gong Fairy (AKA Louvert). The only exception are Lou himself, who'll get his awards from me, and me, who will rely to Lou to confirm any of my pilot's awards. At least one British mention in despatches is in the works, but since Haig did not issue his first despatch until May 1916, MiD's will not be announced until mid-May -- should the recipient(s) live so long! And believe me, no one was more surprised than Gaston. BTW, what happens when the Dead is Dead pilot ... dies? Hey, congrats on the transfer!